Directions: Blackbob and 151st, South on Blackbob to 155th, West on 155th to Blackfoot, South on Blackfoot to 156th Court. Home is on the cul-de-sac. 3 Bedroom, 2.5 Bath, Fenced yard, Walk-out, Oversized Deck, Upgraded Lighting, Wired for home theater system, CAT 5 wiring, Pre-piped for Central Vacuum, has an alarm system and humidifier. Lovely open floor plan with fresh Sherwin Williams Duration paint throughout, gleaming hardwood floors in kitchen and dining room. The walkout finished lower level provides plenty of room for entertaining & newly finished basement is wired for home theater. Completely remodeled in April 2010 including gorgeous new wood floors in dining room, great room, kitchen and hall, fresh interior paint throughout and new frieze carpet in all bedrooms and finished lower level! 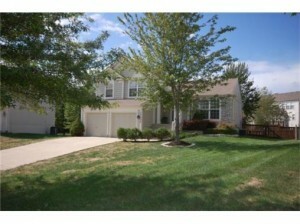 This 5 bedroom 3 bath home shows beautifully. Located on a quiet cul-de-sac, this home has a huge, partially fenced back yard and abundant mature landscaping. New water heater installed 4/2010. The large, open great room/kitchen combo allows plenty of space for entertaining or leisure time. Each bedroom is spacious and the master suite is the perfect place to escape. The finished, daylight lower level includes 5th bedroom and 3rd bath. Sub-basement has finished office!